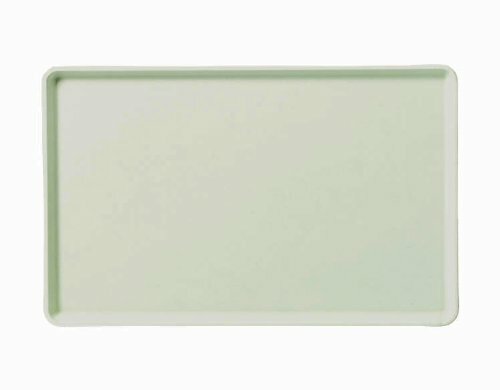 The Carlisle fiberglass Glasteel solid rectangular tray is dishwasher-safe, has rounded corners, and is suitable for serving and carrying food in a restaurant or cafeteria. The tray is made of fiberglass for strength and durability, contains metal reinforcing rods to prevent warping, and can be wiped clean. The edge helps keep items from slipping off the tray. The corners of the tray are shaped to permit air flow and drying when two or more trays are stacked together. This tray measures 20.25 x 15 x 0.75 inches/51.44 x 38.1 x 1.91 cm (L x W x H). (L is length, the horizontal distance from left to right; W is width, the horizontal distance from front to back; H is height, the vertical distance from lowest to highest point.) The tray is dishwasher-safe and meets National Sanitation Foundation/American National Standards Institute (NSF/ANSI) Standard 2 for use in food handling and processing.Carlisle manufactures food service equipment and supplies and sanitary maintenance tools and supplies for commercial, industrial, and institutional facilities. The company, founded in 1954, is headquartered in Oklahoma City, OK. 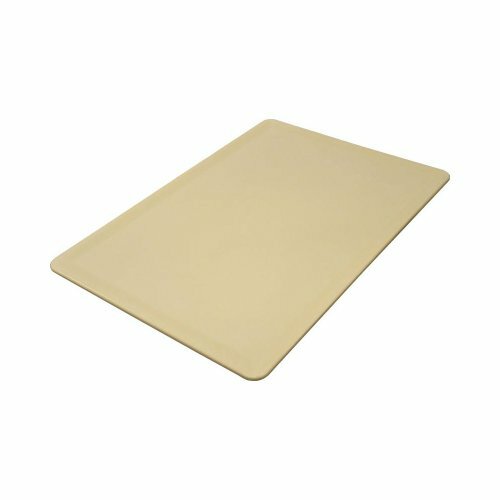 The Carlisle fiberglass Glasteel solid low edge tray is rectangular, has rounded corners, and is suitable for serving and carrying food in a restaurant, cafeteria, or hospital. The tray is made of fiberglass for strength and durability, contains metal reinforcing rods to prevent warping, and can be wiped clean. The edge measures just 0.62"/1.57 cm high, allowing dishes to overhang the tray, so a smaller tray size can be used. This tray is suitable for serving areas where space may be confined, such as in a hospital room. The corners of the tray are shaped to permit air flow and drying when two or more trays are stacked together. This tray measures 16.37 x 12 x 0.62 inches/41.58 x 30.48 x 1.57 cm (L x W x H). (L is length, the horizontal distance from left to right; W is width, the horizontal distance from front to back; H is height, the vertical distance from lowest to highest point.) The tray is dishwasher-safe and meets National Sanitation Foundation/American National Standards Institute (NSF/ANSI) Standard 2 for use in food handling and processing.Carlisle manufactures food service equipment and supplies and sanitary maintenance tools and supplies for commercial, industrial, and institutional facilities. The company, founded in 1954, is headquartered in Oklahoma City, OK. 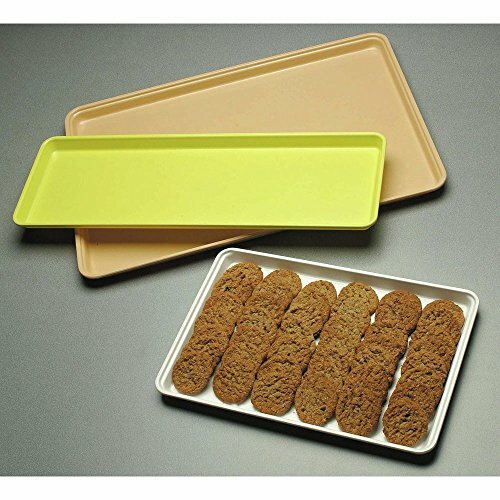 The Carlisle fiberglass Glasteel solid low edge tray is rectangular, has rounded corners, and is suitable for serving and carrying food in a restaurant, cafeteria, or hospital. The tray is made of fiberglass for strength and durability, contains metal reinforcing rods to prevent warping, and can be wiped clean. The edge measures just 0.62"/1.57 cm high, allowing dishes to overhang the tray, so a smaller tray size can be used. This tray is suitable for serving areas where space may be confined, such as in a hospital room. The corners of the tray are shaped to permit air flow and drying when two or more trays are stacked together. This tray measures 18 x 14 x 0.62 inches/45.72 x 35.56 x 1.57 cm (L x W x H). (L is length, the horizontal distance from left to right; W is width, the horizontal distance from front to back; H is height, the vertical distance from lowest to highest point.) The tray is dishwasher-safe and meets National Sanitation Foundation/American National Standards Institute (NSF/ANSI) Standard 2 for use in food handling and processing.Carlisle manufactures food service equipment and supplies and sanitary maintenance tools and supplies for commercial, industrial, and institutional facilities. The company, founded in 1954, is headquartered in Oklahoma City, OK. 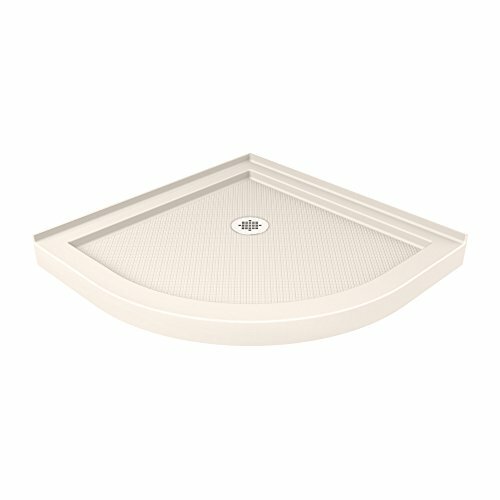 The DreamLine SlimLine quarter round base may be used in a custom shower project or combined with a DreamLine Prime 8482; or Solo 8482; shower enclosure for a complete shower installation. The modern shower bases (also referred to as shower receptors, shower trays or shower floors) have a low profile design for a clean polished look. DreamLine shower bases deliver a smart alternative to the time and cost involved with custom tile, with a product that is easy-to-install and an excellent value. Made of attractive high gloss Acrylic/ABS materials, the bases are fiberglass reinforced for durability. Each quarter round shower base come standard with a slip-resistant textured floor pattern, 2-side integrated tile flanges and an opening ready for a standard compression fitting drain. DreamLine offers a collection of cUPC certified low profile shower bases. These shower trays are cUPC certified, which affirms they are in compliance with applicable American and Canadian codes and standards. Biscuit is a very popular off-white color that provides a warm tone to your bathroom. The color biscuit is a neutral color that never goes out of style and offers a classic look. Biscuit can also be described as bisque, bone, almond, beige, ivory, cream and sand. 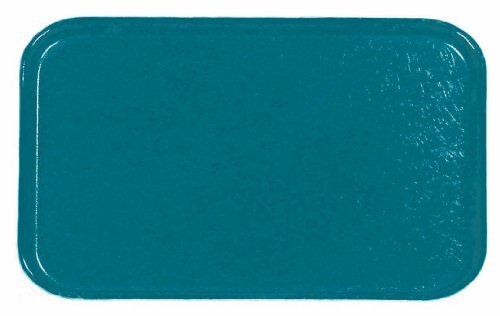 The Carlisle fiberglass Glasteel solid Euronorm tray is rectangular, has rounded corners, and is suitable for serving and carrying food in a restaurant or cafeteria. The tray is made of fiberglass for strength and durability, contains metal reinforcing rods to prevent warping, and can be wiped clean. The edge helps keep items from slipping off the tray. The corners of the tray are shaped to permit air flow and drying when two or more trays are stacked together. This tray measures 17.72 x 12.6 x 0.67 inches/450 x 320 x 17 mm (L x W x H) and meets dimension standards established by the European Committee for Standardization (CEN). (L is length, the horizontal distance from left to right; W is width, the horizontal distance from front to back; H is height, the vertical distance from lowest to highest point.) The tray is dishwasher-safe and meets National Sanitation Foundation/American National Standards Institute (NSF/ANSI) Standard 2 for use in food handling and processing.Carlisle manufactures food service equipment and supplies and sanitary maintenance tools and supplies for commercial, industrial, and institutional facilities. The company, founded in 1954, is headquartered in Oklahoma City, OK. 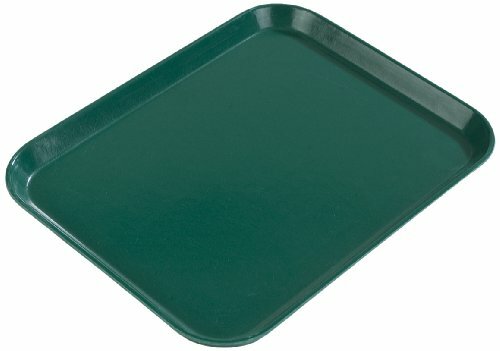 This Carlisle decorative tray is a stackable, rectangular tray for food service applications. It is made of Glasteel fiberglass reinforced by metal rods for lightweight strength and resistance to warping. 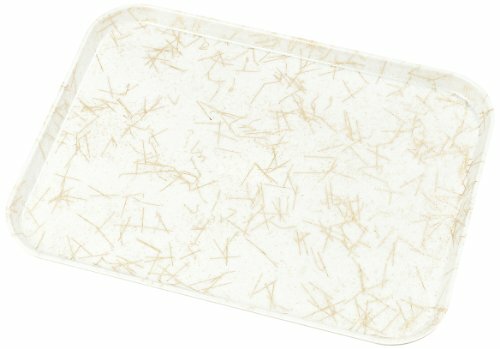 This tray is dishwasher safe and certified by NSF International for use in food handling and processing, and measures 0.75 x 20.25 x 15.00 inches (H x W x D). (H is height, the vertical distance from lowest to highest point; W is width, the horizontal distance from left to right; D is depth, the horizontal distance from front to back. )Carlisle manufactures food service equipment and supplies and sanitary maintenance tools and supplies for commercial, industrial, and institutional facilities. The company, founded in 1954, is headquartered in Oklahoma City, OK.